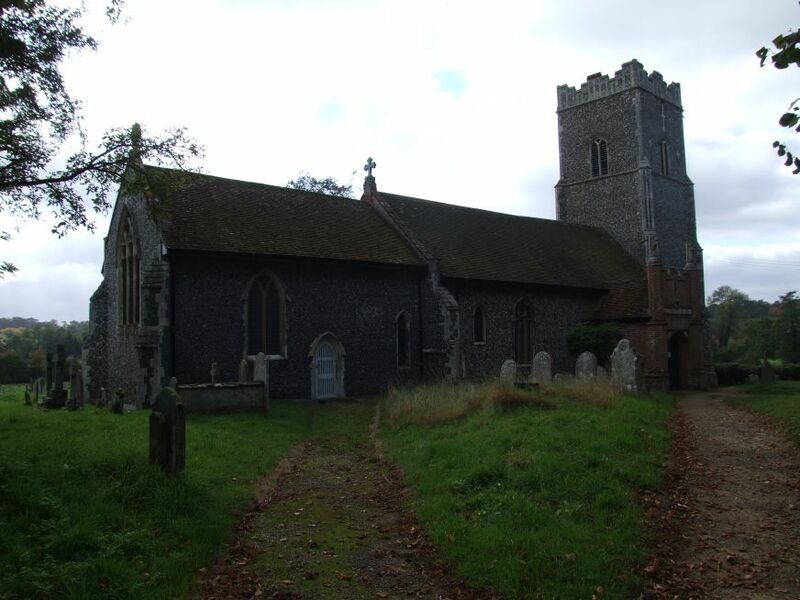 Despite our proximity to the sprawl of greater Ipswich, this church is in a decidedly rural setting in the rolling, wooded fields to the north-east of the town. In the thin light of winter, the building seems organic, sitting in a a wild churchyard surrounded by open land on all four sides, from which it is separated by a fine old wall. A path through an avenue of trees leads from the main road to the north east corner. This is one of the churches within a couple of miles of my house; despite this, or perhaps because of it, I hadn't been back here for some eight years before December 2007, and I had forgotten what a rich confection it is. Of course, not much has changed in that time, except that the building is open to visitors every day, but I doubt that it gets as many as it deserves. The tower is 15th century, and has a good image niche. The Victorians and Edwardians were busy here (as we shall see) and much of the stonework of the nave and chancel is new, especially on the south side. The large early 16th century brick north porch bears the iconography of the Seckford family, and another image niche. Beneath this, the white band bears the remains of a painted dedicatory inscription. 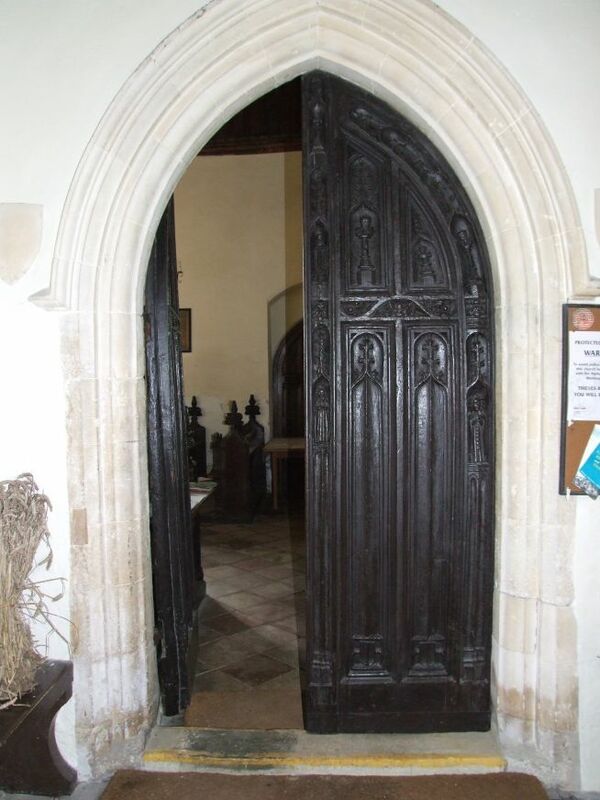 The inner doorway retains the original door, put here when the porch was built, and carved with standing figures, including one holding a rosary. 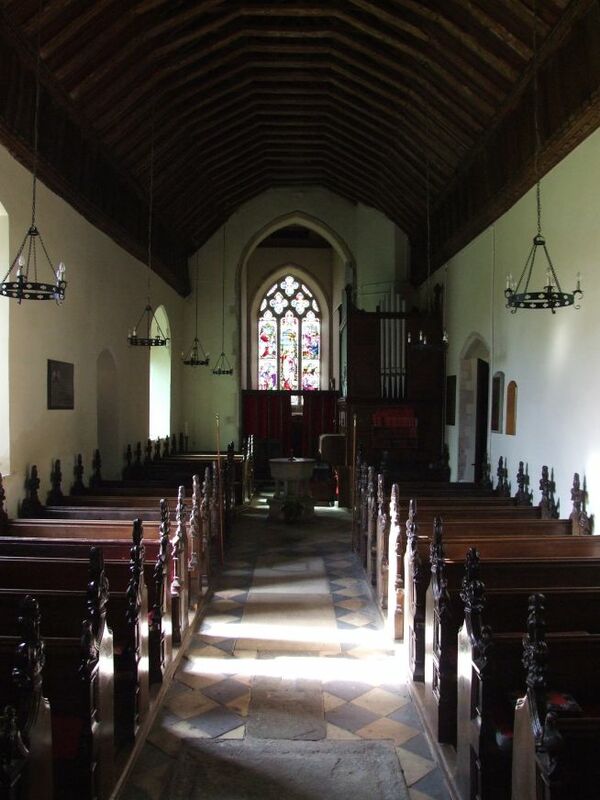 It opens into a long, narrow, slightly dim nave. 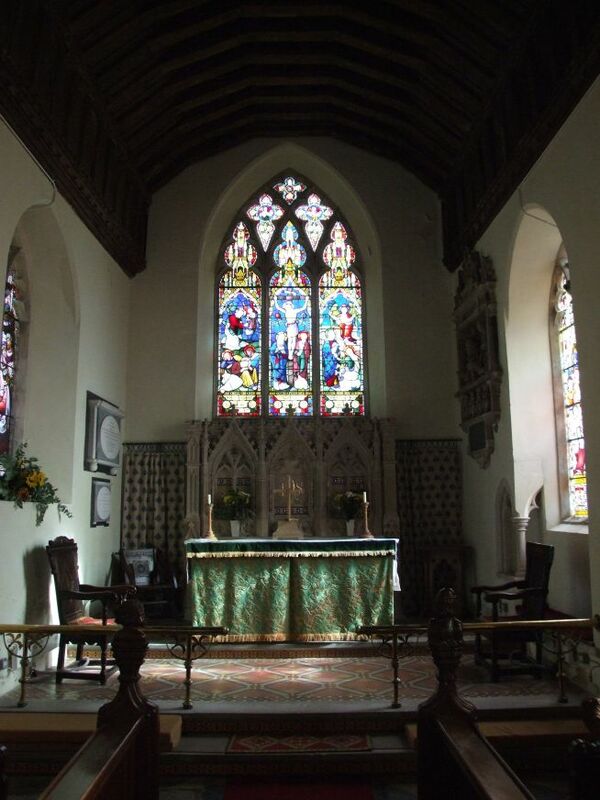 To the east, the chancel seems high above us, the eyes drawn to it by the coloured light. It is most effective. 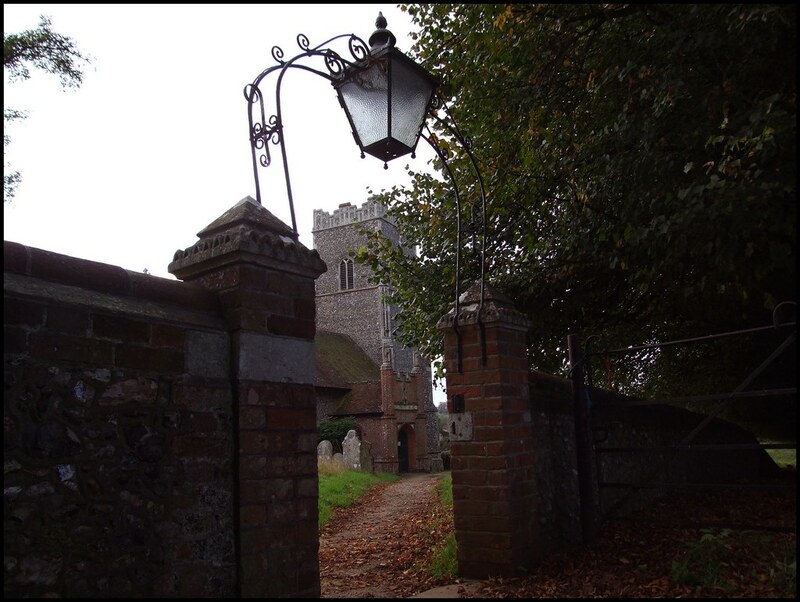 Both times I've been here, I came from the church of neighbouring Little Bealings, and the contrast between the two is striking. Little Bealings, set in the middle of its lovely village, is simple and rustic, and full of light. Great Bealings, by contrast, is darker and rather serious inside, glowing gently from the range of late 19th and early 20th century glass. 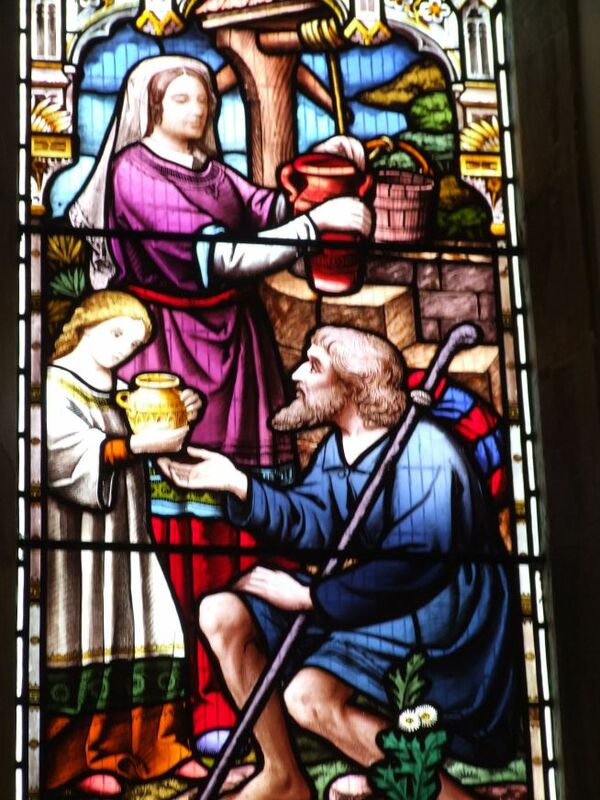 Probably the best of the glass is the set of the Works of Mercy in the west window, which Mortlock attributes to Ward & Hughes. 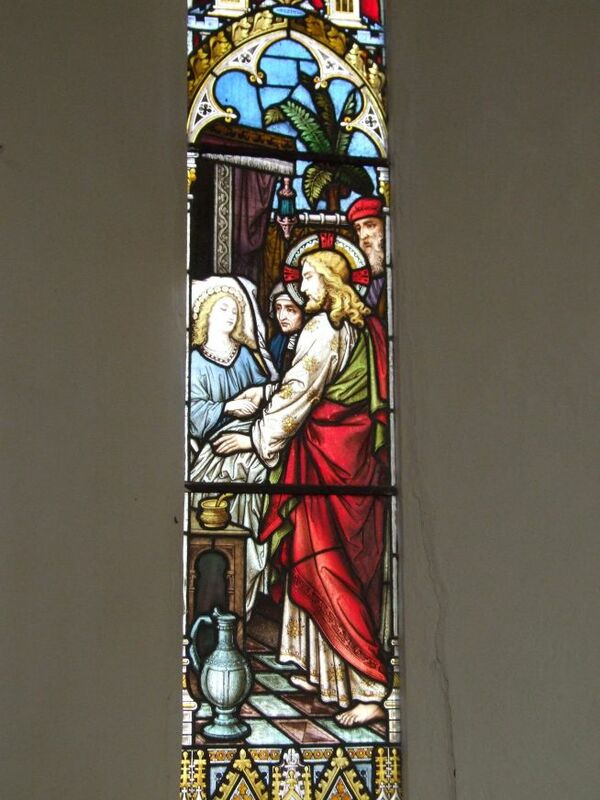 Much of the rest of the glass appears to be by Lavers, Barraud & Westlake, but Mortlock draws our attention to the beautiful work by Mayer & Co in the chancel depicting Christ in the Temple. I'm also fond of the lancet depicting the Raising of Jairus's Daughter - this was a popular subject in sentimental 19th century days as a memorial for a dead daughter, and the inscription beneath it remembers Charlotte Olivia Alice. The nave is full of Henry Ringham's extraordinary carvings, the best 19th century woodwork in the county along with Ipswich St Mary le Tower. 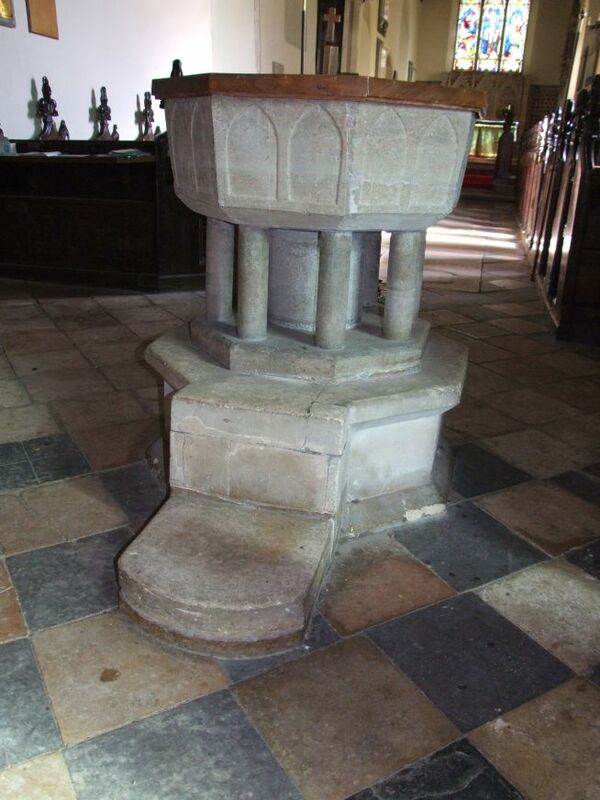 The gorgeous medieval originals, of which they are copies, can be found towards the west. They really are glorious, particularly those of the pelican in her piety, another example of which can be found at nearby Tuddenham St Martin, almost certainly by the same carver, and possibly originally from this church. I'm also fond of the fisherman. The tall finials on the choir pews are symbols of local landed gentry, rather less subtle than Ringham's work, but lively and amusing nonetheless. They are apparently the work of Edward Moor, who was the father of the vicar here in the second half of the 19th century. My favourites are the rhinoceros (for the Webb family) and the boy's head (for the Moors). The church contains two grand monuments. One is in the chancel, to John and Jan Clench, who face us with stern puritan expressions, as if contemplating their fate. Their kneeling sons beneath are accompanied by two painted skulls. 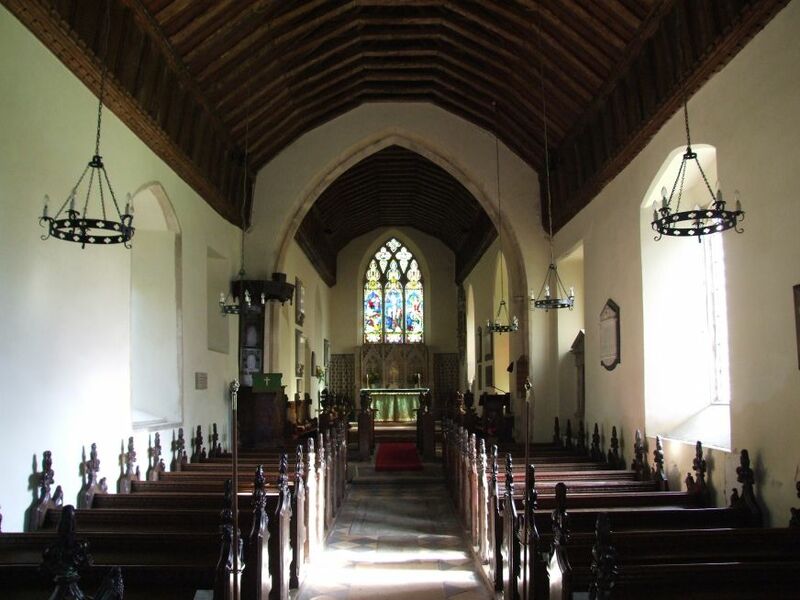 That in the nave is to Thomas and Margaret Seckfords descendants of the Thomas Seckford who built the porch. 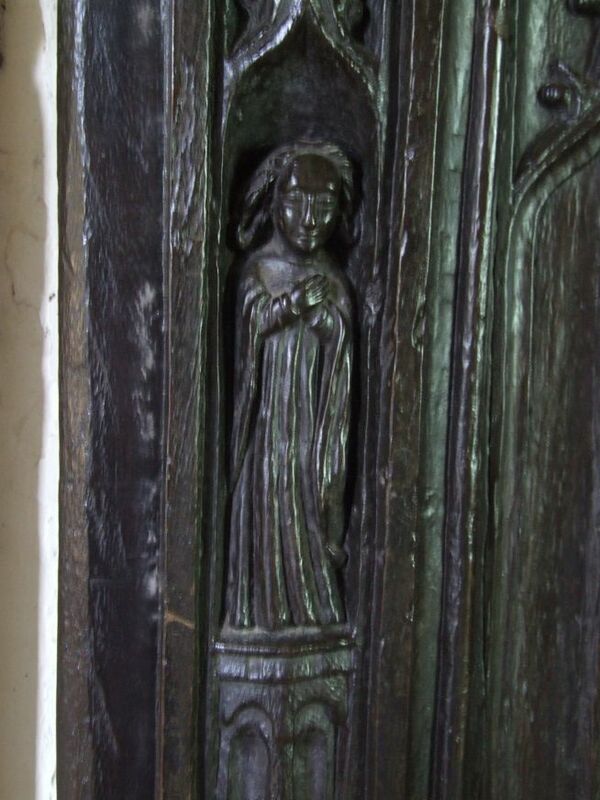 Most moving of all is the late 19th century brass by the north door to Charlotte Allen, grand-daughter of the Edward Moor who carved the chancel finials. She died at the Holme, New Galloway in 1891, at the age of 38. A week later, her remains were laid to rest in the south-east corner of her old home churchyard.